Dwolla payments to and from Mt. Gox, the world’s largest Bitcoin exchange, are on hold. The Department of Homeland Security has seized the funds that the Bitcoin exchange, Mt. Gox had on Dwolla, the American e-payments company. 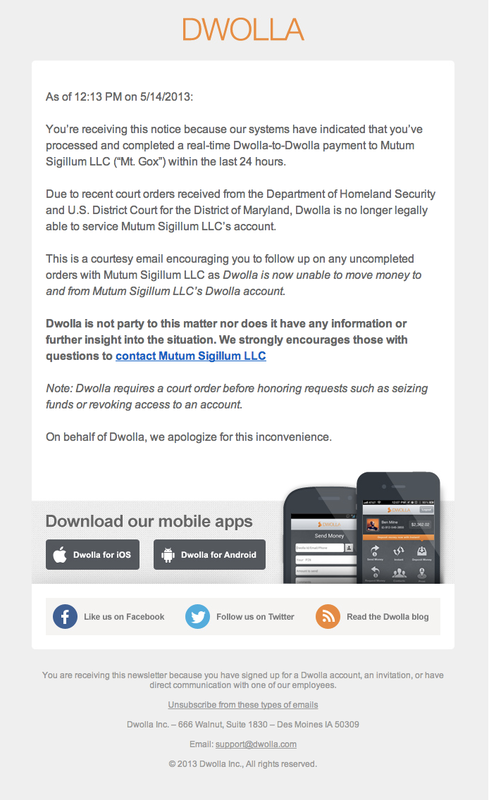 Dwolla users now receive a message when attempting to access their accounts. ICE’s purview is far broader than their name suggests. What is the point of the seizure? Terrorism comes to mind, as some have expressed fear that Bitcoin is being used by terrorists, as it has been by drug enthusiasts. Others have suggested this is the first battle in a campaign against the largely unregulated cyber-currency economy, one which is likely to see its front line along the fault between users and the currency, that is, at the exchanges that handle transfer between fiat currencies and bitcoins. DHS did not return request for comment by press time. UPDATE: According to the seizure warrant, DHS shut down Mt. Gox’s account because the company failed to register Mutum Sigillum, LLC as a “money services business.” As the Daily Dot has previously reported, the U.S. Treasury’s Financial Crimes Enforcement Network (FinCEN) declared that Bitcoin businesses are money services businesses in a report earlier this year.